Transport Secretary Stephen Byers has quit his job, saying it was "the right thing to do for the Labour Party and the government". Mr Byers has been under fire for months, initially for standing by spin doctor Jo Moore after she sent an email on 11 September saying it was a good day "to bury" bad news. He has also faced criticism from the City over his decision to force Railtrack into administration. There have been a series of claims that he lied to Parliament - all of which he has denied. The most recent, following the Potters Bar rail crash, came from the Paddington train crash survivors' group. An MPs' report published at the weekend branded Mr Byers' 10-year transport plan "incomprehensible". Returning to his North-East home on Tuesday evening, Mr Byers told waiting reporters he had nothing to add to his earlier resignation statement. "This has been a nightmare of a day for me and I am just really pleased to be back home on Tyneside," he said. Earlier, at a hastily-arranged news conference at 10 Downing Street, Mr Byers admitted making mistakes and said his continued presence "damaged" the government. Mr Byers' resignation was welcomed by the Conservative and Liberal Democrats - but both parties attacked Prime Minister Tony Blair for standing by him for so long. In a brief statement, Mr Byers said resigning was "the right thing to do" for the Labour Party and for the government. 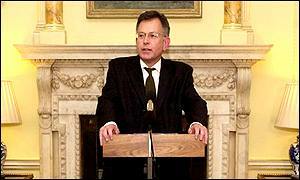 Prime Minister Tony Blair said he "understood and respected" Mr Byers' decision. Mr Byers is understood to have told Mr Blair of his decision to leave the government at an hour long meeting on Monday. In his statement, My Byers said he stood by the major policy decisions he had made. But he said that, with hindsight, there were things he would have done differently. "Government ministers take many decisions and I know I have made mistakes, " Mr Byers said. But he said he had tried to "behave honourably", adding "the people that know me best know I am not a liar". He went on: "What is clear to me, however, is that I have become a distraction from what the government is achieving, that the debate we need to have about key policy issues is being distorted by my involvement, that by remaining in office I damage the government. "Having worked for the Labour Party all my adult life, it is not easy to admit to that reality. "But I cannot and will not allow this to continue," Mr Byers said. Mr Byers' replacement as Transport Secretary will be announced on Wednesday. Downing Street insiders have told the BBC Mr Byers had "simply had enough" and he "recognised that he was becoming the story". Martin Sixsmith, who was "resigned" by Mr Byers from his job as PR chief at the transport department, said: "I am Stephen Byers' director of communications and I will be until Friday when my formal contract runs out. "So I cannot comment on Stephen's resignation except to say that I think it is a great pity that it ended like this." Home Secretary David Blunkett said the resignation was a "personal tragedy for Stephen Byers". "To resign in the interests of the government as a whole takes great courage," he told BBC News. But Conservative leader Iain Duncan Smith said Mr Byers could not get away with simply saying he had tried. He said Mr Byers had fostered a "culture of deceit, half-truth, and quite often down-right failure to tell the truth at key moments". "My concerns are that in going he seems to think that he has nothing to answer for whatsoever," he told BBC Radio 4's PM programme. Liberal Democrat leader Charles Kennedy said: "Stephen Byers has finally done the honourable thing - and not before time. "From any point of view, his position had become untenable." But Labour former transport minister Glenda Jackson said she was "very sorry" he had gone. She said the feeling on Labour's backbenches was that Mr Byers was doing a good job. But he may have been "too honest and too loquacious" to survive as a minister. London mayor Ken Livingstone, who has clashed with Mr Byers over transport policy, said "I didn't agree with Stephen Byers about the financing of the London Underground, but I was able to work well with him on other issues. "Stephen Byers did not create the transport crisis - after 25 years of under-investment, he inherited it." Why did he go now? What should be Darling's first move? Was Stephen Byers right to resign?